Now just like any other gearhead, I have an infatuation with cars that are fast, flashy, low to the ground, and go like the dickens. But there’s something inside of me, probably residue of a childhood laden with Tonka Trucks, that loves a big SUV. There’s a certain point where handling and performance go out the window and the unapologetic presence of a tank can be justified. The QX80 smashes past that point and then keeps going with the debris in tow. When laying eyes on the machine for the first time, its sheer size is the first hint of an endangered species among the fuel-sipping hybrids in vogue today. Standing 76” tall, 80” wide, and 208” long, the phrase “living room on wheels” can be taken literally in a city like San Francisco where our loaner Infiniti spent its time. Fortunately, an army of cameras and parking sensors make it relatively easy to exploit parking spots that appear to be too small with surgical precision. It also weighed as much, with our fully loaded example pushing nearly three tons. Unlike some modern SUVs, the QX80 refuses to hide its weight under the scorn of bullies. Instead, it flaunts all 5,878 pounds of girth with body roll that will make occupants think that they've landed in the ocean. Even a dab of brakes sends the nose diving below the horizon line with enough vigor to make a pilot let out a “mayday” yelp. The 7-speed transmission deals with the performance well, but it’s anything but telepathic when quick downshifts are needed. We’re sure that when this ability is distilled through all four wheels using the all-wheel drive system, the vehicle would do decently off road, but we never got the chance to find out. A moderate ground clearance, flashy 22-inch rims, and the fact that sending engine power to all four wheels is only an option means that this SUV is intended for duty in the suburbs, not the trails. On the other hand, hard acceleration yanks the front bumper upwards and ahead. That's because under the hood lies a 5.6-liter V8 that guzzles an EPA-estimated 13-mpg city in exchange for 400 horsepower and 413 lb-ft of torque. Our lead shoes and constant stop and go traffic returned mileage numbers closer to 8 mpg, but it’s driving like this that allowed us to discover that a rush from 0-60 winks by in only 6.5-seconds. It’s not that the QX80 is sporty or a road warrior in any way, but there are many aspects that make a driving experience luxurious and the ability to effortlessly pass cars that get too close for comfort (which happens a lot when you turn a mammoth loose onto narrow lanes) is one of them. Speaking of luxury, the QX80 reeks of it from every nook and cranny. Not only does it have a vast range of capabilities enabled by its huge V8, it also insulates passengers from the harsh realities of the outside world. In fact, the Infiniti is among the small group of cars that actually slows the pulse. The cabin is unnaturally quiet, and with shock absorbers that feel like they’re filled with butter, it isn’t uncommon to save the finger and instead give a Zen-like smile to drivers who cut you off during rush hour traffic. And just like an all-expense vacation at a five-star resort, the Infiniti just doesn’t know when to stop pampering. Any aspect of vehicle ownership that takes effort has been thought of. Want to lower the second and third row seats to turn the giant SUV into a wannabe semi-truck? Just flick a handful of switches and the seats fold down. Like many of its competitors, opening and closing the lift gate only requires a button. Any owners wanting to eliminate any and all effort by hiring a chauffeur will be happy to know that like a Rolls Royce, the back seat is arguably the best in the house. The second row seats are captain’s chairs and can be reclined and heated. Under the real wood of the rear center console is a remote that controls screens embedded in the headrests. Headphones flank rear passengers inside the pockets of the doors and turn the rear seats into first class real estate. Of course, the 15-speaker Bose sound system is superb, using aid from the heavily insulation to turn the Infiniti into a private concert hall. Even though the infotainment system takes a bit of getting used to, it’s not as slow, buggy, or hard to make inputs into as other systems. Taking a quick glance over your shoulder while driving solo on an empty peaceful road is when all of this starts to sink in. A sense of calm sweeps over any stressful thoughts because behind the wheel of this SUV, an alternate reality exists where you’ve made it and nothing else matters. Nowadays, plenty of automakers charge huge premiums for any semblance of luxury, whether it’s executed well or poorly. 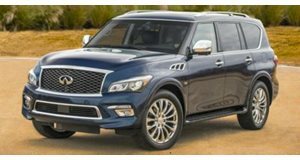 Despite the seemingly steep $89,845 premium that it costs to enter this rolling luxury condominium, the Infiniti QX80 is a bargain. 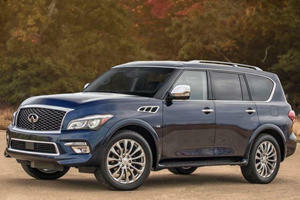 Should You Buy An Infiniti QX80 Instead Of A Bling-tastic Cadillac Escalade? It's like a tank. Only with leather.